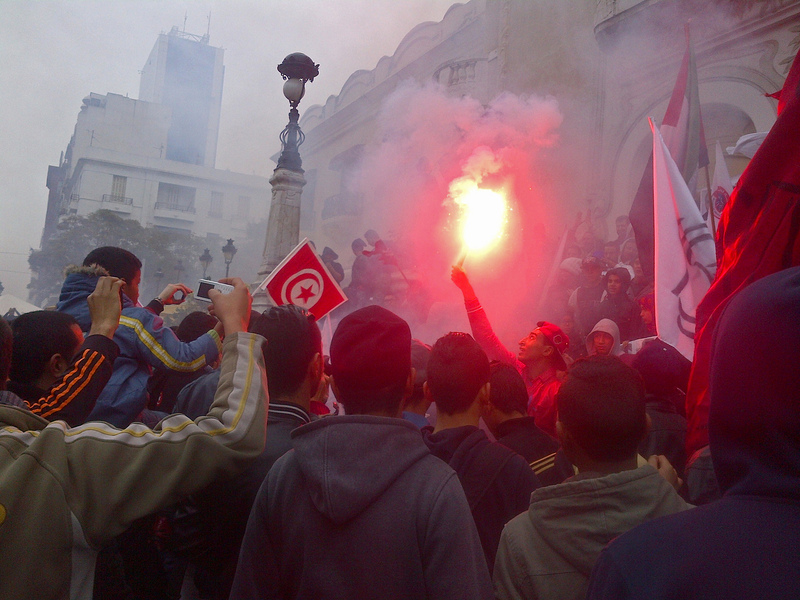 A New Constitution, The Same Tunisia? After almost six years since the beginning of the ‘Arab Spring’, Tunisia is considered a case of success in terms of democratic transition . Zine El Abidine Ben Ali’s dictatorship came to an end on January 14 2011, when he fled with his family to Saudi Arabia, leaving Tunisia in an unstable economic, political, and social situation. Tunisia’s new constitution, one of the Arab world’s most progressive – which recognizes Islam as state religion, protects the freedom of belief and gender equality in politics and society and ensures political pluralism – was ratified at the end of January 2014 and has been testing its resilience and capacity to overcome obstacles. The Islamist Ennahda Mouvement, which ruled Tunisia from October 2011 until the summer of 2013 (in coalition with Ettakatol and Congrès pour la République) stepped down from the National Constituent Assembly. This happened after they lost credibility among the population for failing to accomplish the promises of the election campaign, and because of the political deadlock created after the murder of leftist deputy Mohamed Brahmi, attributed to the party. In this context, and with the emergence of the Quartet for the National Dialogue , the National Constituent Assembly, under the guidance of Mehdi Jomaa, formed a non-political technocrat cabinet with eleven of the parties with the largest number of parliamentary seats (also integrated experts from the Ministries of Finance and Foreign Affairs). This cabinet government ruled Tunisia until 2014 parliamentary elections. In October 2014, Tunisia held the first parliamentary elections, with the victory of the newly created secular Nidaa Tounes (37.56% of votes, corresponding to 86 seats of the Assembly of the Representatives of the People). In November 2014, Tunisia returned to the polls to elect a new President. Two candidates were selected for a second round in December: Beji Caid Essebsi, former Ben Ali official and Nidda Tounes leader, with 39.46% and Moncef Marzouki, incumbent head of state, with 33.43%, culminating in the victory of the first one with 55.68% of the vote. President Essebsi pointed out Habib Essid as Prime Minister, who left his post in August 2016 after being deposed as result of an internal parliamentary vote on July 30th 2016. He was succeeded by Youssef Chahed, a researcher and academic professor. In February 2015, after more than a month of negotiations, the secular party Nidaa Tounes, with 86 parliamentary seats, formed a coalition with the Islamist Ennahda Mouvement (with 69 seats), the popular Union Patriotique Libre (16), the leftist Front Populaire (15), the liberal Afek Tounes (8) and the popular Courant de l’Amour (2). The revolution: a fading memory? The 2014 elections result settled Tunisian’s democratic transition. Currently, Tunisia is immersed in a post-revolution spirit: the population complains about revolution as “a fading memory”, “the lack of prospects for economic development and the problems for economic growth” and the threat of terrorist groups such as ISIS. However, Tunisia is better off today than five years ago. The Freedom House 2016 report claims that it was able to exceed three terrorist attacks, the state of emergency imposed during much of 2015 and the ban on public demonstrations – all while implementing the new constitution and establishing its first constitutional government. The ‘Arab Spring’ started on December 17th 2010, when Mohamed Bouazizi (26) immolated himself on a street in Sidi Bouzizi after being humiliated and beaten in public by the police when confiscated his car sales and forced him to pay a fine for license sale expired. Nobel Peace Prize in 2015 “for its decisive contribution to the building of a pluralistic democracy in Tunisia in the wake of the Jasmine Revolution of 2011” and constituted by four civil society organizations: Union Générale Tunisienne du Travail (UGTT), Union Tunisienne de l’Industrie, du Commerce et de l’Artisanat (UTICA), Ligue Tunisienne pour la Défense des Droits de l’Homme (LTDH) and Ordre National des Avocats de Tunisie (ONAT). ← An African Exodus from the International Criminal Court?